Love Bailey Jean: One Little Word 2014 || January Link-Up! One Little Word 2014 || January Link-Up! It's that time again! The second One Little Word link-up is officially underway! January was the introductory month and our prompts encouraged us to explore our word and our reason for choosing said word in depth. Honestly... this project got away from me. But I have been so looking forward to doing it and sharing my answers with you all! Unfortunately my page protectors and album have gone MIA in the mail, so these awful and slightly yellowish/red photos will have to suffice. Maybe next month I'll remember not to try to take the pictures at 1am in my basement bedroom. So many factors working against me here... any who. SURRENDER. My word for 2014. You can't tell but the top half of the page is a glittered vellum. 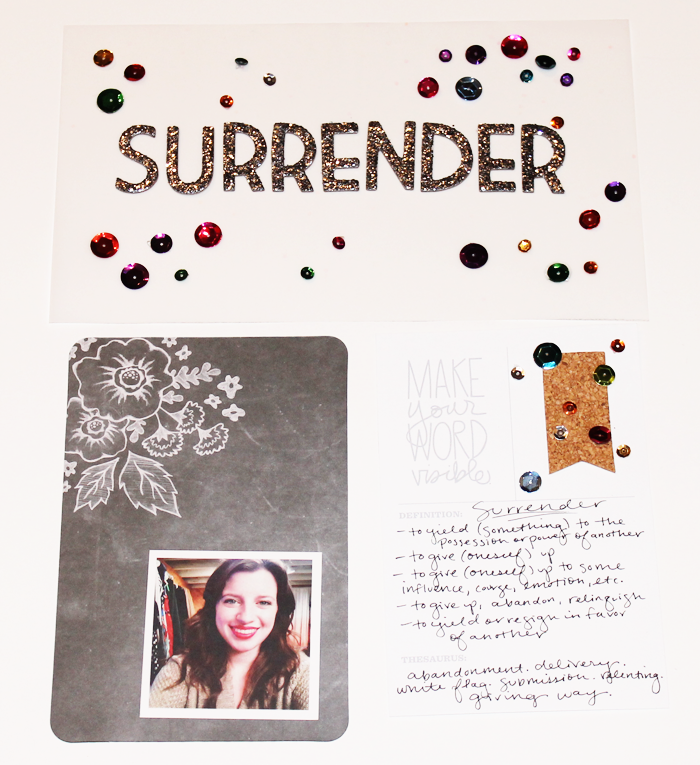 I added the sequins and decided to make them a recurring theme because I want to choose to celebrate surrender. The idea doesn't exactly sound fun or make you think of a hip-happenin' party, but with Jesus every day is cause for celebration. And who doesn't love confetti? -to give (oneself) up to some influence, course, emotion, etc. The thesaurus provided the words abandonment, delivery, white flag, submission, relenting, giving way. The next prompt was for a quote or inspirational saying. I found a few with the word "surrender", but I chose to use the lyrics from Hillsong United's "Oceans" instead. This song is a bit of an anthem, and more of a prayer for this year. I want to have a heart willing to say yes, ready to step out onto the waters, eyes locked on Jesus, unwavering and unworried about the waves. 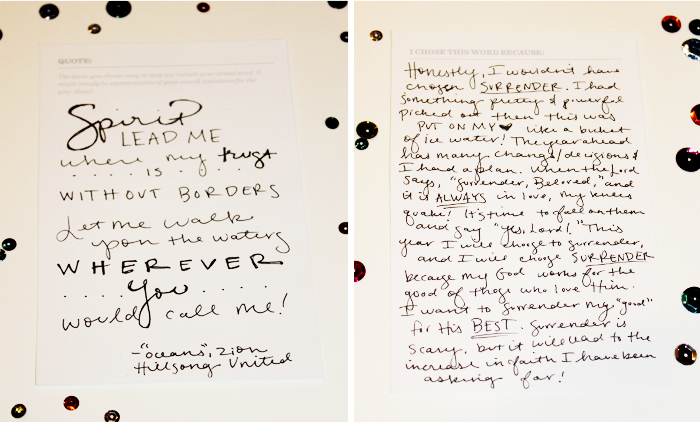 I want to be willing to go wherever He might call me, even if it breaks from my comfort zone. The second prompt left space for me to give a brief summary of why I chose the word. Honestly, I wouldn't have chosen this word. It was put on my heart at the start of the year and I have already seen evidence that this is much needed. 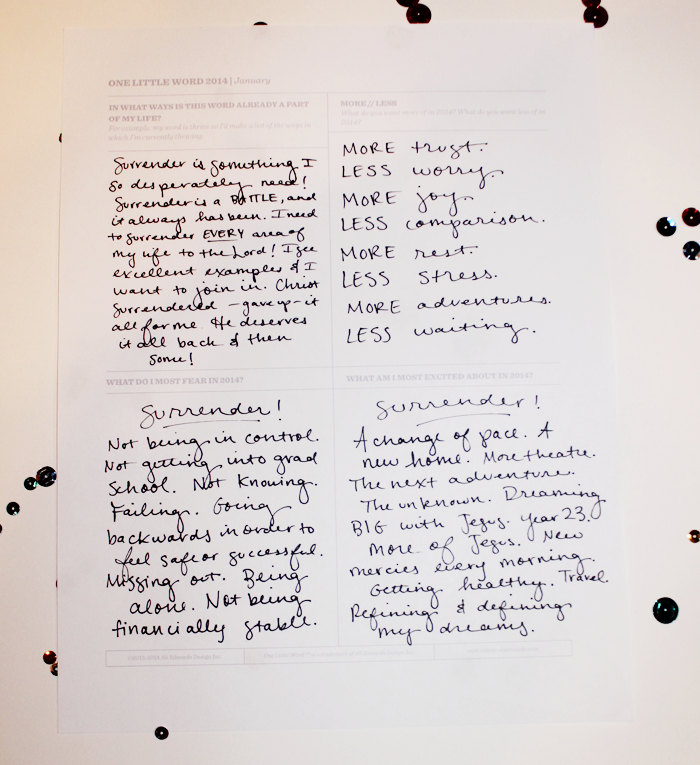 I really enjoyed filling out the full pages, and the prompts really got my wheels turning about what SURRENDER means to me this year. It also turns out that I am most afraid of and most excited for the act of surrendering! It will certainly be an interesting journey. The LESS/MORE section is one I'm thinking of printing and putting in my planner. I need to remember it daily. 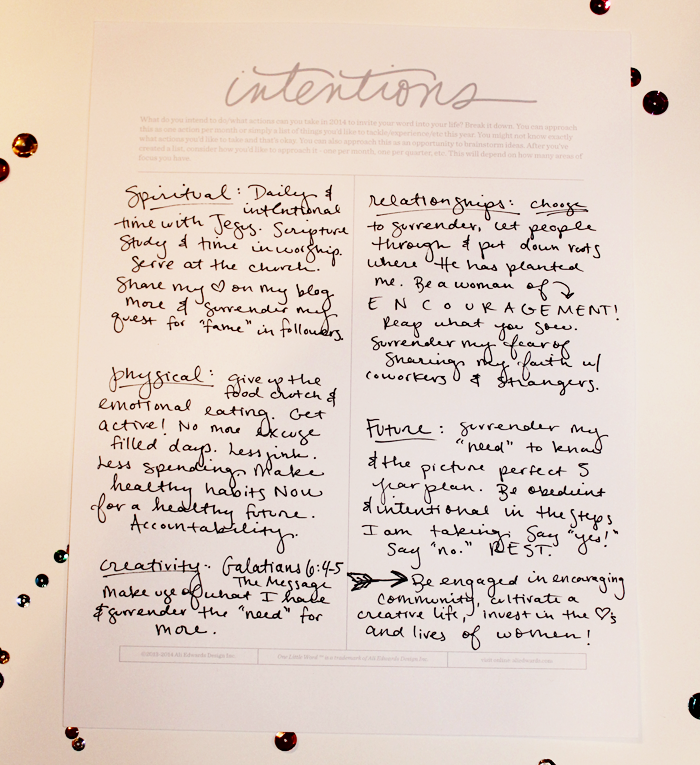 Last but not least was the intention's page. I thought about listing specific goals, but I have several goal sheets/planning devices going already. These are simply things I want to keep in mind and directions I want to go. And I had to end with my big dream. It is the root of all and surrender will lead me there! I cannot wait to check out each of your pages! Don't forget to link up below and say hello to a neighbor. Oh, and grab the button if you'd like, too! Your pages are beautiful. I love your MORE/Less section! Surrender is such a scary word. I know for myself I like to be in control and the idea of surrendering that control to God, is hard. I know in my head that He will take care of His children, but it's much harder to "know" that and trust that He will. I pray that God will use your willingness to surrender greatly! Your blog is just gorgeous. I am excited to start Blog Everyday in February with you tomorrow! It is one of those nights. "Go on. Live your dream." Don't worry, I plan to. Join the Blog Everyday in February Challenge!